Performance. Safety. Style. We manufacture a wide array of styles to meet your business needs, from insulated and non-insulated doors for internal and external applications to high-performance, sectional-steel and fire-rated doors. Overhead Door’s commercial and industrial doors are the premier choice for durability, serviceability and hassle-free performance. Large doors that are ideal for situations where sideroom and headroom are at a premium. We also install a series of garage doors from Haas Doors. We install garage doors for various commercial spaces, including auto body shops, fire stations, warehouses, storage units, pole buildings and more. For any loading dock equipment needs you have in the northwestern Vermont area, rest assured that Overhead Door Co. of Burlington can handle it! We offer a variety of dock equipment doors and products for all types of cargo transportation and dock environments. 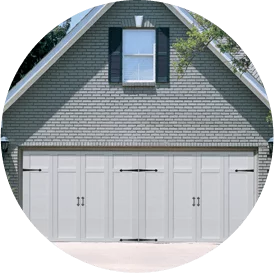 Overhead Door Co. of Burlington offers a wide variety of commercial garage doors, so we can help you find the perfect one for your building. No matter your needs, our team has you covered. Contact us today to learn more about our commercial products! When you’re ready to add a new garage door to your building, there’s only one name to know: Overhead Door Co. of Burlington! Get in touch with our experts by calling 802-448-4752 or contacting us online today.